We always tend to think that RMS Titanic sank on its first trip, but that is not really true. But, since Titanic was built in Belfast it somehow had to get from Belfast to Southampton, so that was in fact its first trip. Belfast was a very important city in those days where they produced boats, among those the most famous, Titanic. 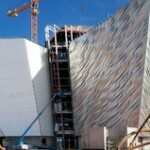 Today a giant museum can be visited in Belfast, built in memory of Titanic. It opened recently, and it is expected to draw almost 500,000 visitors a year, making it the most important tourist attractions in Northern Ireland together with The Giants Causeway. Inside the museum you can see exhibitions dealing with the following subjects: Boomtown Belfast, The Shipyard, The Launch, The Fit-Out, The Maiden Voyage, The Sinking, The Aftermath, Myths and Legends, Titanic Beneath. The last mentioned exhibition gives the chance to see the current Titanic at the bottom of the sea, from a fish perspective. The Titanic museum is a giant museum in Belfast, and a must-see for all visitors. The Titanic Museum is less than 2km from Donegall Square, so on foot you can easily get here in a short time. The museum is not so far from the Odyssey Arena. Buy your tickets before arrival from Viator.